BCP™ 1000 and 2000 Series liquid products work within a complete chemical treatment program to maintain clean comfort cooling water systems that operate at peak cooling efficiency. Used in conjunction with a registered biocide, AMSA BCP™ chemistry controls microbial biofilms and minimizes the risk of the presence of pathogens in cooling systems. 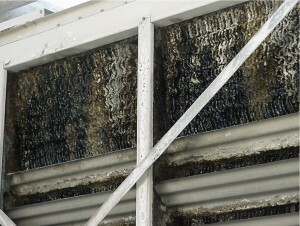 Cooling towers that provide air conditioning to buildings need scheduled cleaning and regular maintenance. 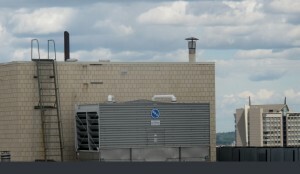 In fact, Legionella outbreaks have been reported in cooling towers that service industrial and commercial buildings. AMSA BCP™ liquid products make cooling tower disinfection programs more effective. The addition of BCP 1015, BCP 2430, or BCP 2175 before dosing with an oxidzing or non-oxidizing biocide help the biocide penetrate biofilm and better disinfect cooling towers during cleaning procedures. 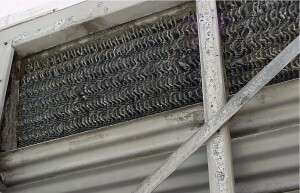 When AMSA BCP products in liquid or solid form are used regularly in a cooling tower maintenance treatment program, the cooling water systems are kept clean and biological control is more easily achieved. DTEA II™ tablets are specifically designed for maintaining small and medium sized cooling systems. These tablets are ideal for treating systems on a monthly service plan. They are also more convenient than liquid chemicals for treating roof-top cooling towers. AMSA BCP™ liquid 1000 and 2000 series products are well suited to clean up fouled comfort cooling towers. The before and after pictures below highlight a comfort cooling tower in Las Vegas that was cleaned with DTEA II™ (BCP™ 1015). AMSA BCP™ Liquid and DTEA II Solid Slow Release Tablets are perfect solutions to maintain small, hard to reach comfort cooling towers, such as building towers located on a rooftop. Small comfort cooling towers in hard-to-treat areas need maintenance too!